Given Ryan Flaherty’s reputation as one of the most tech-savvy trainers at the highest level of professional sports—a soft-spoken metrics whiz who once pocketed $2,000 off Heisman Trophy winner Johnny Manziel for correctly predicting the quarterback’s 40-yard dash time down to a tenth of a second—I expected to see a much cooler gym setup from him. After all, when the owner of Prolific Athletes, based in Carlsbad, CA, isn’t training the NCAA’s top football prospects for the NFL combine—the league’s yearly predraft data fest measuring all things strength, speed, jumping, and agility—Flaherty is drawing up quant-based workout programs for tennis superstar Serena Williams, Bayern Munich midfielder Mario Götze (who scored the deciding goal for Germany in the 2014 World Cup final), USA Rugby speedster Carlin Isles, and countless Major League Baseball players and USA Track & Field Olympic athletes. This is the guy who once told a reporter that, when he watches athletes play, he “sees in numbers” only, as if he looks past their flesh and directly into their biological machinery. So when I arrive at Flaherty’s latest ultra-exclusive six-week NFL combine camp one chilly January morning in San Juan Capistrano, CA, I’m surprised to discover no million-dollar bio-monitors with electrodes sprouting off athletes in gleaming, full-body supersuits, no glowing screens flashing columns of numbers that pour down ad infinitum. Nor is there any space-age machinery scattered about, processing heart rates, speed, acceleration, intensity, or power figures. Frankly, I’m not certain I even see a Fitbit. It’s just your standard gym where guys are lifting free weights and running sprints while listening to music. And had those guys not been top NCAA prospects, like quarterbacks Jared Goff of the University of California and North Dakota State’s standout Carson Wentz (who “took the NFL combine by storm” and may be “the biggest star” of this year’s NFL draft, Sports Illustrated’s Peter King would later write), I would’ve thought I’d taken a wrong turn and ended up at some high school’s early-ball conditioning session. But no, I’m in the right place. And as I learn, Flaherty is even more obsessed with quantitative analysis than I’d previously thought. He just doesn’t need sci-fi equipment to gather his data, and his workout philosophy and training process are so disarmingly simple and effective, it’s hard to believe. 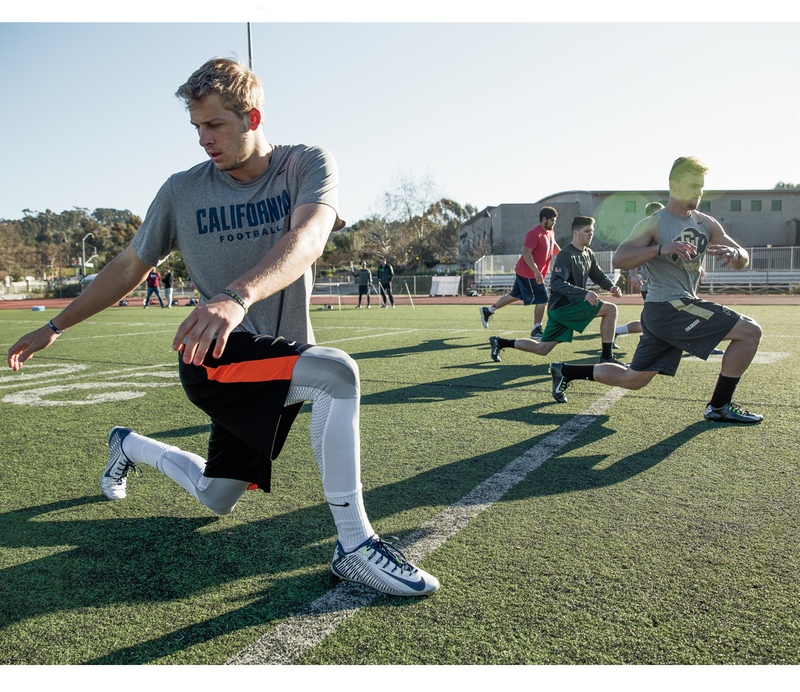 Over several years of refining his approach to helping star athletes build power, explosiveness, and speed, he has developed a proprietary formula that yields a single crucial metric that informs everything he does. 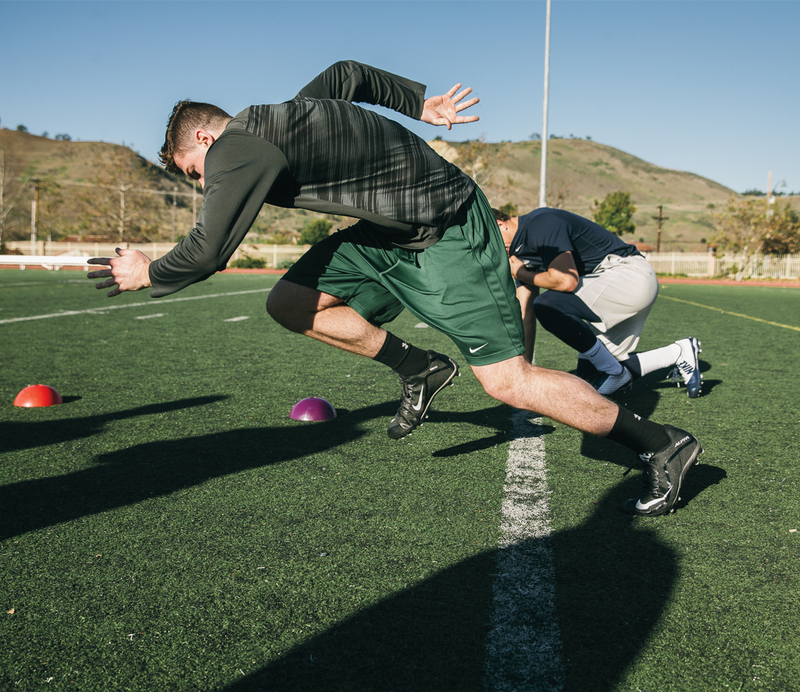 So if you’re an aspiring professional athlete looking to take your body to the next level—and, say, sprint like DeSean Jackson, jump like Julio Jones, or explode off the line like J.J. Watt—you pay Flaherty upward of $20,000 for one of 12 spots at his camp to learn your figure and improve it. Yes, it sounds pretty cool, like some crazy stuff straight out of Star Wars. But unlike that metaphysical force, Flaherty’s number actually exists. Believe me, I know. I’m here because he’s going to tell me mine. I meet Flaherty and his clients on a high school football field with a backdrop of low, dusty hills. As his colleagues lay out a set of neon cones in a grid, a handful of agents—all middle-aged white guys in polo shirts—stalk the sidelines and take hushed phone calls. Flaherty, 33, is tall, with an athlete’s sure-footed presence. 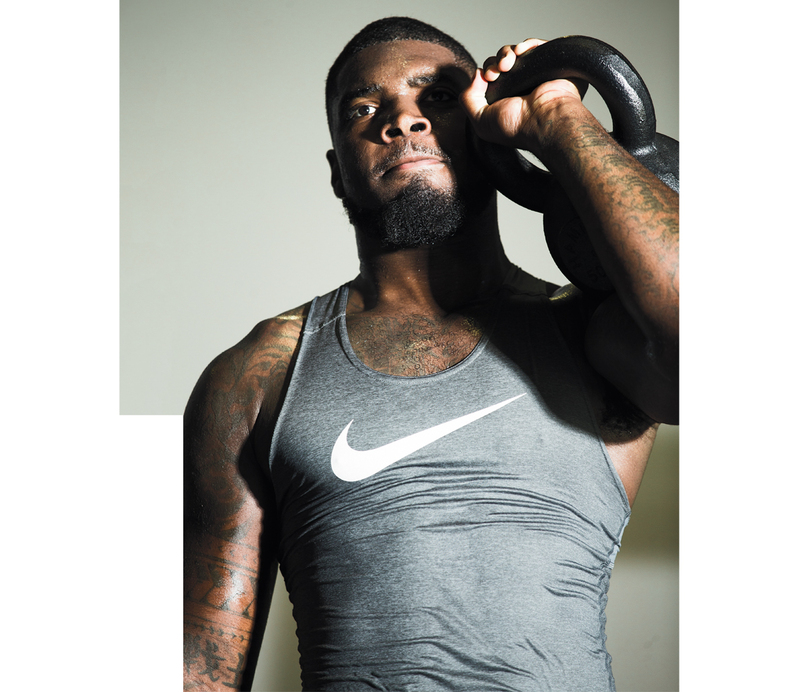 He’s also talkative, with colorful opinions on fitness springing rapid-fire from his mouth. If a football player wants to run a blazing 40—clocking in at 4.5 seconds or less—Flaherty says, his seventh step needs to land at or past that 11-yard line. Period. Step counts, Flaherty has learned through thousands of hours of research, are an incredibly reliable indicator of race results. When you adjust for height, he says, the athlete who takes the fewest steps during any race will win because longer strides indicate an athlete is generating more force per step than his competitors. Over the course of a race, that extra distance per stride compounds. In a 100-meter sprint it could mean the difference of a step or two at the finish line; in a marathon, with about 20,000 strides taken, that extra three inches per step puts a runner a full mile ahead of his previous pace—exactly what Flaherty observed in 2014 after training pro distance runner Meb Keflezighi, who won the Boston Marathon just two weeks shy of his 39th birthday. No matter what, he tells the group, the goal should be hitting that seventh step at the 11-yard cone. Vigil steps up to the line for another go. And the surefire way to create more ground force, he says, is to attack one power lift really, really hard. 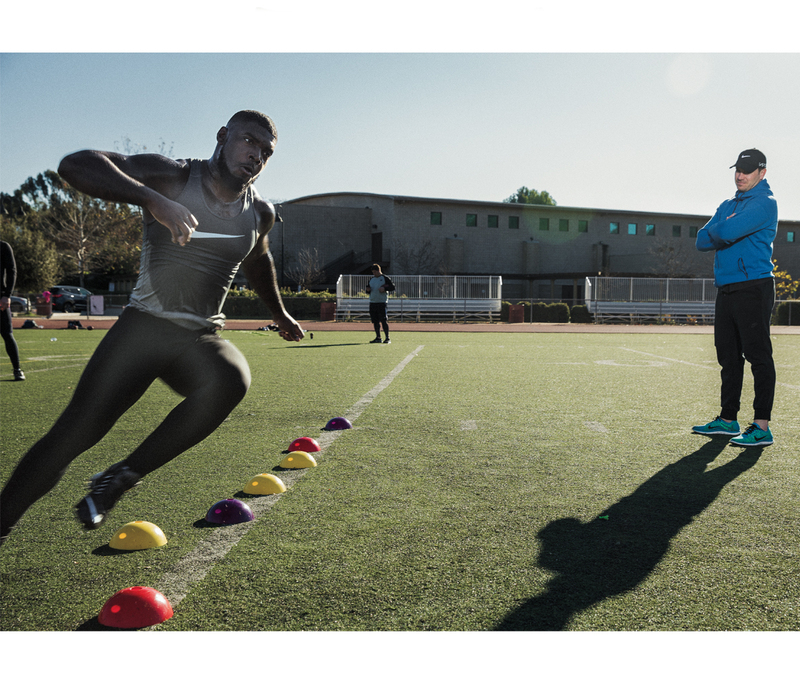 Flaherty’s long journey to becoming an elite trainer began when he was a young athlete growing up in Los Angeles, which is where he discovered that speed is something that can be taught. Flaherty attended Utah State University on a football scholarship, playing wide receiver. His athletic career ended there, derailed by chronic ACL injuries. He moved to San Diego, where he earned an undergraduate kinesiology degree with a master’s in biomechanics from San Diego State University. He started training and observing local track athletes and became obsessed with the question of what makes one athlete faster than another. It should be noted that the highest Force Number doesn’t come from the athlete with the highest peak ground force, but the athlete with the highest peak ground force relative to his body weight. It’s an important distinction, and one he notes when showing me the next slide, which compares each athlete’s Force Number with his 100-meter sprint time. The correlation is, to be sure, perfect. The sprinter with the highest force number has the fastest time, the next-highest force number aligns with the next-fastest time, and so on, all the way down the line. He has since tested his force theory on more than 6,500 athletes and consistently found, with 99% accuracy, that the larger the Force Number, the stronger the athlete is, the faster he can run, and the higher he can jump. The answer, ultimately, was the hex-bar deadlift. Also known as the “trap-bar” deadlift, it gets its name from the hexagonal-shaped bar the lifter steps into, effectively allowing him to center himself over the weights (see above). Unlike a traditional straight-bar deadlift, a lift using the uniquely shaped hex-bar takes pressure off the lifter’s spine, lower back, and hamstrings. Also, because of the more balanced range of motion, out of every lift in the gym, it’s the one on which your body can lift the most weight. (Yes, even more than a squat.) Because the hex bar is so efficient, every rep utilizes 90% of skeletal muscle. What’s more, these are the same muscles you rely on to run, jump high, and explode upward, fighting gravity. In 2014, Flaherty used the hex-bar deadlift to skyrocket Manziel’s combine numbers. Manziel arrived at Flaherty’s camp with a maximum hex lift of 530 pounds, a vertical leap of 27.5 inches, and a 5.09-second 40-yard dash. Weighing 201 pounds, his Force Number was 2.39. 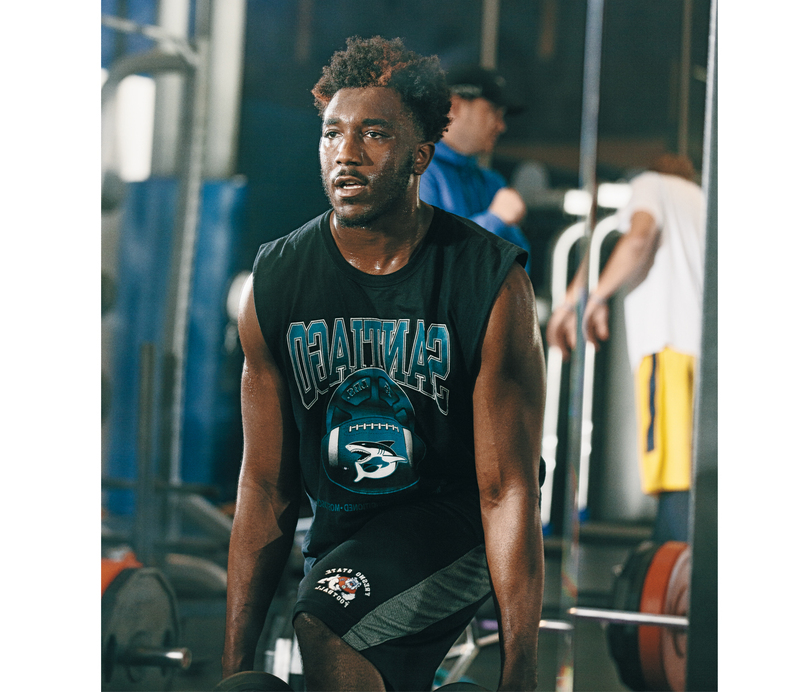 After two months of Flaherty’s deadlift program, Manziel had packed on eight pounds of muscle—and could lift 680 pounds for a Force Number of 3.2. Official combine stats recorded Manziel with a 31.5-inch vertical leap and a 4.68-second 40-yard dash, an improvement of about 0.4 second. At the high school in California, hex bars are everywhere, scattered about like weapons in an armory. 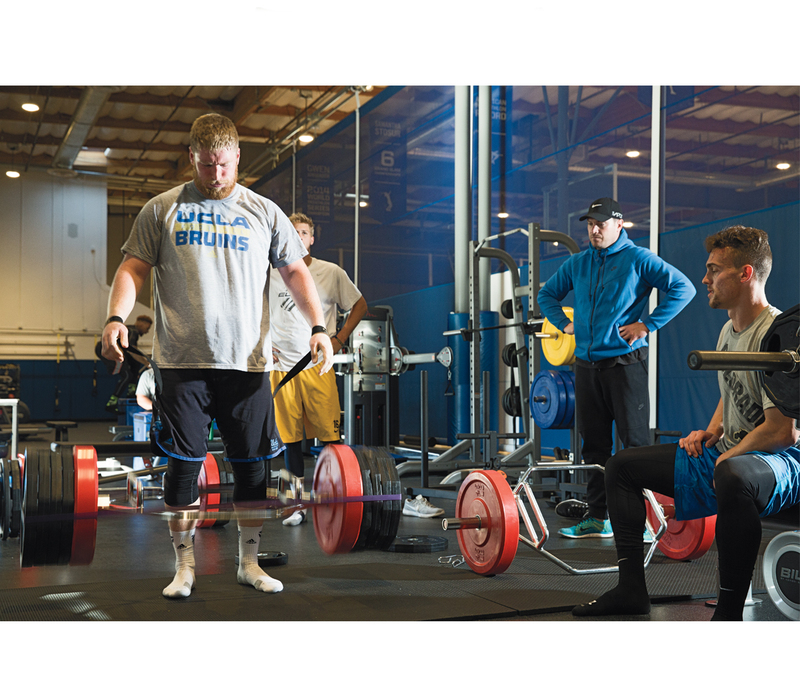 Later that afternoon I watch first as NFL hopeful Jake Brendel, a 6’4″, 300-pound offensive lineman sporting a UCLA T-shirt and red Viking beard, steps into the center of one that’s stacked with so many weights, there’s no room for collars. He grips the handles, bends his knees, straightens his back, raises his chin. The bar elevates and then crashes down, over and over again, like a monstrous piston. I do the math in my mind: five 45-pounders on each side plus the bar itself over five reps means he’s lifted over a ton. When the 23-year-old drops it for the last time and meanders his way to a box for a round of single-leg jumps, I ask him if he knew how much weight he was moving. Finally it’s time for my own Flaherty-run training session. I enter the weight room, where a portable speaker pumps Lil Wayne as compact halfbacks, wiry receivers, and massive nose tackles rotate between sets of heavy bench presses and pullups. At 5’10” and 185 pounds, I feel like a man shrunk in an industrial dryer. But I get to work, kneading myself on a foam roller in advance of my deadlift session. This is my first workout of the day—meanwhile, Flaherty’s clients, following speed drills and a long round of various skill work run by a corps of position experts, are on their third. Flaherty puts me through a few low-weight test runs of the hex-bar and settles on four sets of four reps at 365 pounds, around 90% of what he calculates is my training max of 405 pounds. The lift feels as balanced and natural as it feels hard and satisfying; more than anything, I immediately feel the burn in my forearms and glutes. After a quick break, Flaherty cycles me through five reps per leg of single-leg seated box jumps. The rest between sets is way longer than I’d imagined it would be—four to five minutes—but Flaherty says it’s necessary for recovery when you’re working with weights this heavy. He tells me that a good target range for the average guy is a Force Number of anywhere from 1.8 to 2.4, which is “a great place to be in terms of bone density, muscle mass, and overall relative strength, to allow them to do any activity and be at their peak.” So I’m pleased when Flaherty calculates my Force Number at 2.2, which he says is pretty good. Now that I know my number and I’ve finished my hex-bar session, Flaherty leads me to the other main component of his workout: the fine-tuning. He puts me through a series of single- and double-leg jumps, then shows me some data on a laptop, pointing to a place where my figures plateau. Something’s out of whack, he says. So he stands me on the edge of a box and instructs me to balance on one leg, lowering for three seconds and raising for two, 15 reps per side, as he watches my range of motion. Like most trainers, Flaherty is a stickler for form, and he calls these microscopic movement dysfunctions “power leaks.” I have more than a single power leak, including one that stems from an underdeveloped vastus medialis obliques, otherwise known as the teardrop-shaped part of the quadriceps that sits inside the knee. To ultimately improve my hex-bar deadlift, he says, I need to “plug those leaks” and restore balance and efficiency of movement with a series of smaller exercises. (According to Flaherty, the popular canon of complex bilateral movements, like squats and Olympic lifts, actually mask those little deficiencies, so it’s important to look for them.) So I do a series of stepping exercises using a theraband with many slow, controlled reps and hip exercises in which I lie on my side and rotate my legs forward and back, working the hip muscle at the joint. These controlled, unilateral exercises look to the naked eye like simple rehab work, but Flaherty assures me I’ll soon hate them as much as everyone else in the gym. He’s not wrong. During the slow stepping exercises, my whole body burns and trembles as I try to balance. Though I detest squatting in general, I find myself curiously fantasizing about being under the weight of a bar instead of hovering all jelly-legged. In a back room afterward, I catch up with Flaherty again as the athletes around us inhale cubic yards of food and lounge on couches watching SportsCenter. I still can’t get over how elementary the whole thing seems. Flaherty, with a scientist’s cool confidence, assures me it seems simple only because it’s so effective. And I’m not the only one who appreciates the simplicity. “For athletes, it’s really easy because they have a number,” Flaherty says. “Like, ‘My strength-to-weight ratio needs to be 3.2 for me to run a 4.5-second 40 for the rest of my life.’ Marcus Mariota does the hex-bar deadlift programming one day a week to maintain his number. But he’s also doing the Tennessee Titans weight-room program, which is nothing like mine, but it all works perfectly. Only once over the course of two days do I see Flaherty bristle. It happens early in the trip, when I casually drop the phrase “celebrity trainer.” He doesn’t like the term. His programming is based on research, he says, insisting that people should listen to him only because of what he’s saying, not because of whom he trains. But then my brain ping-pongs from Russell Wilson to Serena Williams, Cam Newton, and Jameis Winston. There are a lot of championships and playoff appearances among that group. Like Flaherty says: The data never lies. Nail the hex-bar deadlift with these three tips from Men’s Fitness Training Director Sean Hyson.